Alex Wong/Getty ImagesFormer U.S. Ambassador to the United Nations John Bolton speaks during CPAC 2018 February 22, 2018 in National Harbour, Maryland. The newly named national security adviser, John Bolton, reportedly promised President Donald Trump said he “wouldn’t start any wars” if Trump gave him the job. Bolton is set to replace H.R. McMaster, who said on Thursday night that he is resigning from the Trump administration. 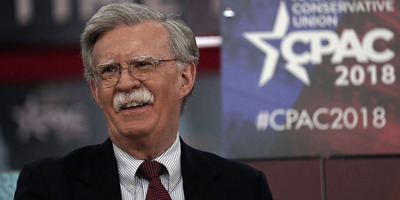 Some political observers have criticised Bolton’s appointment because of his past comments on diplomatic matters like unrest on the Korean Peninsula. Newly named national security adviser John Bolton promised President Donald Trump “he wouldn’t start any wars” if got the position, CNN’s Kait lan Collins reports. Bolton replaces national security adviser Army Lt. Gen. H.R. McMaster, who held the post for over a year. Trump announced the change in a tweet Thursday evening. A former ambassador to the UN under President George W. Bush, Bolton is known for his hawkish positions on North Korea and Iraq.